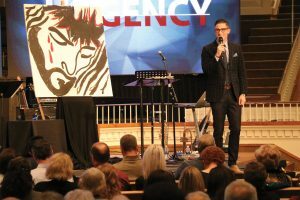 The Oklahoma State Evangelism Conference (SEC) emphasized “Urgency” while meeting at Oklahoma City, Southern Hills, Jan. 29-30. Those in attendance heard many speakers share how “urgently” important it is to evangelize because “the night is coming when no one can work” (John 9:4). Junior Hill was the opening speaker during the Senior Adult Session on Monday morning. Speaking from Psalm 37, the longtime evangelist from Alabama shared how the church should act during bad times. the perspective of those outside the church. Davis, who lives in Franklin, Tenn., said he speaks on comedy tours because he can “get into doors pastors cannot get into.” He said he shares an evangelistic message to people who may never hear it otherwise. Davis also told a story about witnessing to his Muslim neighbor, offering him a Bible. The Muslim neighbor became interested in doing a Bible study and chose to study The Book of Romans because he liked the part, Davis said, that talked about God’s wrath. “So that’s what we did, (a study on) Romans, because I knew he didn’t read the second half,” Davis said, receiving a response of laughter. Hill opened the afternoon session, preaching on The Sower and the Seed from Luke 8. He emphasized, “We are living in a ‘seedless generation,’” and shared how the Devil takes the seed, which symbolizes the Gospel, causing Christians not to witness. Art Hallett, National Director of Prison Ministries at Evangelism Explosion International, also spoke during the Monday afternoon session, preaching on the different churches mentioned in Rev. 2 and 3 and what these churches symbolize. He also gave characteristics of a “Faithful Church,” which include receiving respect from outside the church, given opportunities that cannot be revoked, appearing weak by the world standards but strong by God’s standards and practicing God’s Word. Evangelist David Burton concluded Monday’s afternoon session, emphasizing the SEC theme of Urgency. Burton walked throughout the sanctuary at Oklahoma City, Southern Hills, in a fashion of leading a “pep rally” among SEC attendees. Ed Newton, pastor of San Antonio, Texas, Community Bible is a favorite speaker during the youth summer weeks at Falls Creek. Newton taught out of John 4 about the Woman at the Well. Ed Newton, lead pastor of San Antonio, Texas, Community Bible, was the keynote speaker for the Monday evening session. A favorite speaker during the youth summer weeks at Falls Creek Baptist Conference Center, Newton’s message was titled, “The Harvest Is Here,” as he spoke from John 4 about the Woman at the Well. The Monday evening session ended with two men making professions of faith in Christ. One man came with his wife who was invited by someone she recently met at a Celebrate Recovery meeting. The other man was recovering from an automobile accident and came to SEC by invitation of a friend. “We’ve got to keep our sense of urgency about connecting with the ‘Zacchaeuses’ around our life,” Edwards said. 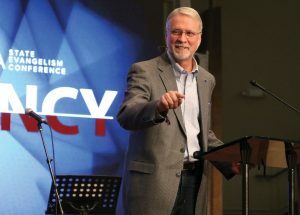 David Burton encouraged those attending SEC to not to be the ‘lock of evangelism in your church,’ rather, he encouraged attendees to be the key. John Sorenson, president of Evangelism Explosion International, spoke on the greatest challenge to world evangelization. 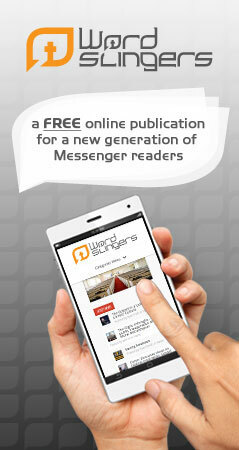 He said it is finding leaders who don’t just talk the evangelism but do it. Other problems Sorenson shared on why Christians don’t share the Gospel is they don’t believe it (Matt. 28:17), they don’t want to share it (Luke 10:30-32), they don’t like lost people (Luke 15:28-30) and they don’t know how to share (2 Tim. 2:2). Don Wilton, pastor of Spartanburg, S.C., First, was going to speak on Heb. 6, as the final speaker of the Tuesday afternoon session, but he changed his sermon and spoke on Gen. 12, sharing his personal testimony. “What happens when one man gives his heart to Jesus?” Wilton asked SEC attendees, and then he proceeded to share what God did in his life as a young man growing up in South Africa. He shared about speaking in a church in New Orleans while he was in seminary, and when he gave the invitation, nobody came, until his own son came forward to make a profession of faith in Christ. At the end of Wilton’s message, he asked everyone in the session to come forward and pray for God to move among the churches. The Tuesday evening session featured Jimmy Stewart, director of evangelism and church development for Alaska Baptist Convention, sharing his testimony. Stewart survived a gas explosion in a vacation cabin in 2016 with 77 percent of his body experiencing third-degree burns. He said the many prayers from churches across the country were a major factor that he survived the explosion. “Always give glory to God,” Steward said at the conclusion of his testimony. Keynote speaker Gregg Matte, pastor of Houston, Texas, First, concluded the SEC, speaking on “Our Urgency Determines Our Legacy.” The text for his sermon was Acts 20, sharing Paul’s final words to the Ephesians. Matte gave three principles of urgency of sharing the Gospel, which are: have a burdened heart, clarity of the Gospel and a surrendered life in sharing the Gospel. He also gave three principles of having a legacy of sharing the Gospel, which are: got to be on guard, drink deeply of Jesus and realize it is hard work. 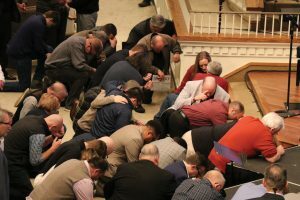 The 2019 Oklahoma State Evangelism Conference is set for Jan. 28-29.